Facebook introduced the HTC First with Home for Android today, and now CEO Mark Zuckerberg is doing the press rounds and discussing everything from “Facebook phone,” building for Android, Google’s reaction to Home, and even why iOS was left in the dark. During the unveiling event, Zuckerberg described building Home for Android as “smooth,” because the platform is open and does not require any Google intervention, where as Home for iOS would require a direct partnership with Apple. Why not just build a phone? I’ve always been very clear that I don’t think that’s the right strategy. We’re a community of a billion-plus people, and the best-selling phones—apart from the iPhone—can sell 10, 20 million. If we did build a phone, we’d only reach 1 or 2 percent of our users. That doesn’t do anything awesome for us. We wanted to turn as many phones as possible into “Facebook phones.” That’s what Facebook Home is. AT&T and Verizon could soon jointly bid to acquire Vodafone. Vodafone is second only to China Mobile for the world’s largest mobile telecommunications companies due to 439 million subscribers and high revenues in December 2011. CNET reported the deal would value Vodafone at $245 billion, if signed. For reference purposes: Verizon’s market cap is now at $142.09 billion, and AT&T sits at 205.88 billion. The deal would also allow Verizon to acquire Vodafone’s 45 percent stake in U.S. operations. AT&T would then acquire the remaining business outside of the U.S. The Financial Times, which cited “usually reliable people,” noted both U.S. carriers feel comfortable sharing the risk associated with such a huge deal and further believe it will pass any regulatory obstacles. Google announced on the Official Google Blog earlier this month that it will retire Google Reader on July 1, 2013, but the brains behind Reeder, a Google Reader client, clarified that development of its apps will continue after July 1. Moreover, since explaining what’s in store for Reeder, both the Mac and iPad apps are now free starting April 1. This doesn’t seem to be an April Fool’s joke, either, as Apple’s App Store and Mac App Store currently reflect the price drops. Feedly for iOS, another Google Reader client, updated to version 14 today and brought a new and improved Feed Search and Discovery function, as well as a Title Only View, Must Read section, and more control over layouts. The update also enhanced Sharing & Save for Later and allows customization of Favorite Sharing Tool to social networks and Favorite Save for Later Tool to Pocket. Version 14 even added a “mark as read” card at the end of each sections, a pull-to-refresh ability in the home selector, and fixes for a logout bug. Aereo—the service that streams over-the-air local television to any Mac, iOS device, or PC running Safari for a monthly subscription—just landed a huge victory against television networks, as the United States Court of Appeals for the Second Circuit rebuffed an appeal today and ruled Aereo does not infringe broadcaster’s copyrights. Aereo transmits television over the Internet, but local broadcasters claimed it does not have the legal license to operate. The Court of Appeals, however, agreed that Aereo’s system—14 of its antennas to be specific—operate independently and a license is irrelevant because subscribers stream their own copies of programs. Each user-associated copy of a program created by Aereo’s system is generated from a unique antenna assigned only to the user who requested that the copy be made. The feed from that antenna is not used to generate multiple copies of each program for different Aereo users but rather only one copy: the copy that can be watched by the user to whom that antenna is assigned. Thus even if we were to disregard Aereo’s copies, it would still be true that the potential audience of each of Aereo’s transmissions was the single user to whom each antenna was assigned. It is beyond dispute that the transmission of a broadcast TV program received by an individual’s rooftop antenna to the TV in his living room is private, because only that individual can receive the transmission from that antenna, ensuring that the potential audience of that transmission is only one person. Plaintiffs have presented no reason why the result should be any different when that rooftop antenna is rented from Aereo and its signals transmitted over the internet: it remains the case that only one person can receive that antenna’s transmissions. Aereo launched in New York City last March and has since landed in dozens of cities, but it has consistently battled opposition from television networks, like Fox, CBS, and NBC, as they attempted to halt its expansion during the last year. Due to today’s ruling, though, as first noted by The Verge, television networks would now need to win an appeal through either the Second Circuit or Supreme Court in order to block Aereo. Amtrak revamped its official app today with support for iPhone 5. The support—like timing for its trains— is a few months late, but the latest version makes up for the wait with a complete redesign of the Train Status feature. Amtrak said the tweaked UI better presents information, but the national railroad corporation also recommended users update to iOS 6.1 before using the latest version of its app. Version 1.5 also reduces Facebook alerts for Amtrak eTickets and removes the 24-hour-wait limit for creating a new account or changing an existing account. Moreover, new accounts are available immediately. Amtrak said changes will launch when the app starts, and it included numerous, unspecified big fixes to improve performance. Google updated its Gmail for iOS app today with the ability to swipe right or left to move between messages without going back to the inbox. Version 2.1 also includes the ability to enable edit mode by selecting a message in the inbox. Once in edit mode, Google said users could tap on messages to select. They can then archive, delete, etc., from the new actions bar, or they can just Cancel to exit edit mode. Gadling, an AOL-owned travel blog, went aboard an American Airline recently to get a sneak peek at the iPad Electronic Flight Bag that the Federal Aviation Administration originally approved in 2011. The iPad flight bag essentially swaps 40 pounds of flight manuals, maps, other bulky documents with an iPad for each pilot and a Hypermac backup battery that extends the iOS tablet’s battery life an extra 24 hours. Since both pilots will be carrying an iPad, coupled with the extended batteries, the FAA feels this is as redundant as the regular manuals. A few weeks ago we saw our first mounts in our MD-80, so I felt a video tour might explain how the setup works and just what it replaces. So far American has approval for the 777, 737, MD-80 and is just awaiting approval for the 757/767 fleet. Hopefully, this will be just in time for my return to that airplane, as once you use this setup, you won’t want to go back to the paper. American Airlines was the first to get official authorization for all pilots during phases of flight, but it had to test the iPad in a hypobaric chamber to get approval. The test basically simulated how the device would respond during a rapid decompression. The company also had to conduct mount testing with the FAA. Canon, the Japanese company behind all-things imaging and optical, unveiled a bevy of new cameras on Thursday. Canon notably manufactures compact digital cameras, as well as film SLR and digital SLR cameras, and now it has bulked its impressive lineup with the new EOS Rebel SL1 Digital SLR Camera, EOS Rebel T5i Digital SLR, and PowerShot SX280 HS Digital Camera. The Rebel SL1 is the most noteworthy addition. Touted as the “World’s Smallest and Lightest DSLR Camera,” and in fact SL stands for “super lightweight,” the camera weighs just 14 ounces. Despite its smaller size, the SL1 carries a standard kit EF-S 18-55mm IS STM optic EOS lens, 3-inch Clear View LCD monitor with two-finger touch gesture support, 18-megapixel APS-C CMOS sensor, and DIGIC 5 image processor that allows up to four FPS. The camera also offers an ISO range of 100-12800 for photos and ISO-6400 for video, as well as handles 1080p video at 34 or 30 FPS, and it features a built-in mono mic and stereo input jack. The EOS Rebel SL1 Digital SLR Camera will become available in April at $649.99 for the body or $799.99 bundled with the new EF-S 18-55mm f/3.5-5.6 IS STM kit lens, but it is available for pre-order at B&H now. For more information on the EOS Rebel SL1 Digital SLR Camera Canon, as well as the EOS Rebel T5i Digital SLR for easy video capture and PowerShot SX280 HS with built-in Wi-Fi, see 9to5Toys. 1. DataMan Pro | $4.99 (usual $9.99) Version 7.2 of this overage-tracking app hit the App Store with support for more data plan types. It also includes monthly, 30-days, weekly, and the newly-added daily plan that allows users to track their data usage everyday with app and location statistics. The app is currently 50-percent off for Easter. 2. Grokr: Intelligent Search | Free Version 1.2 of this search-and-discovery app that provides a Google Now-like experience to iOS users launched with a total redesign today. The update includes a new sports tile, recommended title, events tile, and news sources and sports teams. The app also now sports personalized notifications and Beta-tile for new features. More apps and updates below. Wacom, a graphics drawing tool most pro designers tote around or at the very least drool over, introduced a compact tablet with a full HD display on Tuesday called Cintiq 13HD. As the name suggests, the Cintiq 13HD boasts a 13.3-inch, 1,920-by-1,080-pixel resolution, wide-angle display mounted on an adjustable, three-point stand that is also detachable. The entire form factor debuts at 4.75-by-9.75-by-0.5 inches and 2.65 pounds, which is considerably smaller and more mobile than the earlier 22HD, 24HD, and 24HD touch Cintiq models that are mostly stationary and gobble up 2 feet of desktop space. The chassis notably sports four changeable shortcut buttons, called ExressKeys, the classic Rocker Ring, and a home button, and the swanky tablet further comes with Wacom’s famous pen. The cordless and battery-free Pro Pen specifically touts 2,048 levels of pressure, tilt recognition, and two side toggles, and it includes nine various—standard, felt, and stroke— nibs, a desk stand, and carry case. Last but not least, a regular USB 2.0 data connection through a three-in-one cable pipes the HD display power and signal. The Wacom Cintiq 13HD for Mac and Windows computers launches in early April for $999 in the United States and £749.99 in the United Kingdom. 1. Unbound for Mac Unbound for Mac is a “blazing fast, simple to use” viewing experience for Dropbox photos. It works in conjunction with the Leap Motion Controller. Developer Pixite said Leap makes “a lot of sense for viewing your photos on a big screen or a projector,” and it has made Leap work seamlessly with Unbound. Check out a sneak peak of the Mac app in the video above (it is coming soon to the Mac App Store). Pixite also currently offers Unbound for iOS on the App Store. Dropbox announced on Friday it is buying Mailbox, the highly anticipated mail client with a lengthy reservation list from Orchestra, and clarified it will keep the service running as a standalone app. According to The Wall Street Journal, all 13 Mailbox staffers, which includes former Apple employees, will join Dropbox, although the terms of the deal were not disclosed. “We felt we could help Mailbox reach a much different audience much faster,” said Dropbox CEO Drew Houston, while explaining how Mailbox’s technology could boost certain Dropbox features. Dropbox, which has roughly 100 million users and a $4 billion investor-valuation, wants to use Mailbox for email attachments, because the inspiration for the acquisition occurred after the two companies began talking about email attachments in recent months. 1. KitCam | 99 cents Version 1.6 of this photo-editing app hit the App Store today and introduced Night Snap for KitCam. The feature allows users to take photos in very low light. The update also includes 10 new geometric shape frames, front-facing flash, uncompressed TIFF format, JPEG compression, live exposure data on the histogram, extended time-lapse parameter, new composition grid, export options for originals, and storage and processing speed optimizations. While admitting he as acquired a degree of humility, Browett explained he “just didn’t fit within the way (Apple) ran the business.” Browett also said Apple is a fantastic business with great people, products, and culture, and he loved working there, but he has since become very clear of how he is and what he is like to work with. 9to5Mac first broke the news that Apple sold refurbished merchandise through its own eBay store last year, equipped with the same price tags, full warranties, and approved inspections, and now the company has dropped prices on many of those items below what it offers at store.apple.com. 9to5Toys and eventually Dealnews recently noticed a $100 price cut for Apple’s 13-inch MacBook Air with 1.8GHz i5 and 128GB of storage (now over). It costs $100 more at store.apple.com for the same refurbished unit. 1. Wahwah | Free Wahwah is a personalized radio service that just landed in the App Store, and it offers a catalogue of more than 15 million songs and allows users to discover the perfect song for working, running, cycling, driving, etc. Users can notably check-in to their location, type in the name of an artist, browse custom stations, or select recommended music, while Wahwah sees who is around, taps into their music, and then offers users the ability to simultaneously listen together and interact via chat. 1. Viddy | Free Version 2.1.1 of this Instagram-like app for videos went live today with the ability to handle 30-second clips, pause recordings for multiple-segment filming, toggle brightness, contrast and volume, and simulate stop-motion capture. The updated app also features 15 new filters, all new music tracks, simplified video descriptions, swipe-based navigation, new Explore section, geo-feeds with video discovery, Home feed with user preferences, YouTube annotations, and support for 16 new languages. Marvel launched a new iOS app today, called Marvel Unlimited, that gives unlimited access to a huge range of comic titles. 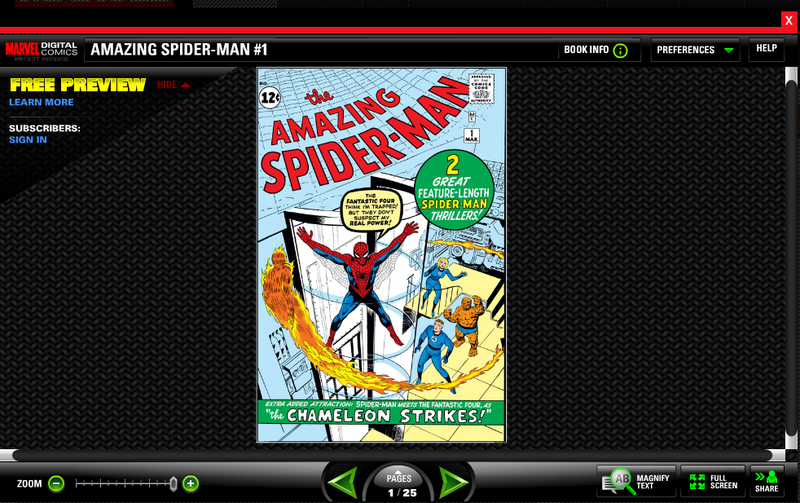 The new app is different from the previously existing Marvel app and expands upon the company’s HTML5 on-demand reader, Marvel Digital Comics Unlimited, that launched recently. The new app features the same subscription model as the web-based version: $10 per month (or a temporary annual subscription for $59.98, equaling $5 per month). Marvel Digital Comics Unlimited is like Netflix or Spotify for comics, as it allows signed-in subscribers to get access to new releases and most popular comics from the last week. Each available issue offers a tappable cover that brings up a story summary and preview sample, and it sports publication details on the original print issue, release date, and creators. Subscribers can choose to read titles immediately or save up to six issues for offline reading. A quick look at the app’s front-page selection on Thursday shows the 1998 No.1 issues of Captain America and Iron Man, 2012 No. 1 issue of Avengers vs. X-Men, 1968 No. 134 issue of Iron Man, and 2010 No. 9 issue of The Twelve, and much more. The bottom menu bar gives users further options for browsing by series, character, creator, or comic events, as well as access to their account. The New York Times reported on Wednesday that Amplify’s CEO and former chancellor of New York City schools and News Corporation’s education division will jointly offer a 10-inch Amplify tablet equipped with Android OS, as well as a curriculum and infrastructure, for K-12 schoolchildren. The touchscreen tablet will mostly land in the hands of middle-school children, and it will feature emoticons for student-teacher engagement, an “eyes on teacher” prompt for wandering eyes, and a unique design that marries technology with traditional teaching. Students can also take the tablet home at night and use it for fun. Amplify chief executive Joel I. Klein, who also serves as an executive vice president of News Corporation since 2011, will need to attractively market Amplify’s tablet in a space that is already brimming with competition attempting to capitalize on K-12 students. Apple, for instance, offers an education discount of 10-pack iPad minis and announced last week that it has sold a total of 4.5 million iPads direct to U.S. education institutions. Ironically, News Corp chairperson and CEO Rupert Murdoch gushed over Apple CEO Steve Jobs in 2010. Murdoch lavishly praised Jobs in a Fox Business interview and applauded his “incredible focus,” but he also notably called the iPad “extraordinary” and predicted Apple would sell at least 10 million units during the year. Do you remember when AT&T tried to buy T-Mobile in 2011? Well, T-Mobile certainly didn’t forget. T-Mobile clearly wasn’t too happy with AT&T over the ads and has now responded with its own campaign on Wednesday, according to TMO News. T-Mobile’s scathing ads will run in many of the same newspapers, but, instead of comparing statistics about dropped calls and download speeds, the carrier went straight to the jugular and said its network must do well if AT&T once tried to buy it.